On the heels of our August 5th post about the recent flurry of media attention for Bryant Park Pétanque, comes yet another article about the French game's renaissance around the globe. Pétanque, and the Bryant Park program, received international recognition last week in an AP article French bowling? Yes, pétanque's got swank, by Emma Vandore. The story was picked up by countless news outlets around the world, including Fox, CBS, ABC, and delves into the game's origins, major tournaments, champion players, and glamorous celebrity enthusiasts. Our Pétanque Courts at 42nd Street and 6th Avenue were given due credit as the epicenter of New York City's cultural "melting pot" of pétanque players. 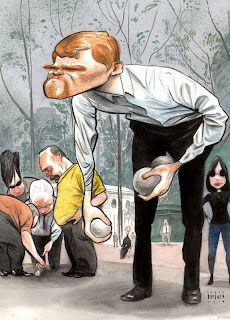 Around the same time, cartoonist Steve Brodner revealed on his website the original Bryant Park Pétanque illustration he submitted to The New Yorker (below), and the behind-the-scenes story of why it was revised before publication. Brodner's Bryant Park Pétanque cartoon that was published in the August 2, 2010 issue of The New Yorker can be seen here.